Thirty years ago on December 6, Malta directed the international spotlight to­wards the protection of global climate. 1988 was a significant year for climate change – it was the year when global warming attracted worldwide headlines after scientists at congressional hearings in Washington identified it as the cause of the great North American drought of that year. That same year, a resolution by Malta on the “Protection of Global Climate for Present and Future Generations of Mankind” was unanimously adopted in the plenary of the United Nations General Assembly. This initiative was the brainchild of Professor David Attard, vice-president of the International Tribunal on the Law of the Sea and director of the International Maritime Law Institute, to whom I pay tribute. Through this initiative, Malta proposed that an appropriate high-level mechanism should be established to address the cause and the effects of changes in climate upon humankind. This mechanism would be tasked to propose legal and political measures to address global warming and its environmental and socio-economic implications. Twenty-one years earlier, Malta had already made a ground-breaking proposal at the United Nations to safeguard the oceans beyond national jurisdiction as a common heritage of mankind. It was now necessary to ensure that the climate too was protected for present and future generations. Once again, Malta wanted to prove to the world that being in a unique position, because of its size and lack of major vested interests, a small state is perfectly able to contribute to the work of the United Nations for the benefit of all. Following months of intense diplomatic work, Malta’s proposal was formally introduced to the General Assembly on October 24, 1988, by the Foreign Minister of the time, Vincent Tabone. Malta’s initiative 30 years ago was visionary, in many ways. First of all, it could already foresee that “changing global climate patterns threaten present and future generations with potentially severe economic and social consequences”. Climate is an essential condition that sustains life on earth, therefore, any changes become a threat to human health, agriculture, animal and marine life. Changes in climate impact a country’s economic growth, erode food security, and may trigger conflict, migration and hunger. Malta’s initiative called for programmes and studies on the social and economic impact of climate change, and response strategies to delay, limit or mitigate the impact of climate change. It also called for the identification and possible strengthening of relevant existing international legal instruments having a bearing on climate, and elements for inclusion in a possible future international convention on climate. Furthermore, Malta’s initiative recognised that climate change affects humanity as a whole and should be addressed within a global framework to take into account the vital interests of mankind. It called upon NGOs, industry and other productive sectors to play their due role. Malta’s initiative was the beginning of a process that led to three important international legal instruments: the 1992 United Nations Framework Convention on Climate Change (UNFCCC), the 1997 Kyoto Protocol and the 2015 Paris Agreement. Under the leadership of Prime Minister Joseph Muscat, Malta is also proud to recall that atthe executive session of the CHOGM of 2015, held in Malta on the eve of COP21 that gave the world the Paris Agreement, was instrumental in sustaining the momentum to achieve this remarkable multilateral legal instrument that paves the way for a carbon neutral planet by the end of the century. Today, the Paris Agreement of 2015 and the sustainable development goals are considered the foundations of global efforts to address climate change. The 24th meeting of the parties to the United Nations Framework Convention on Climate Change, also known as COP24, a key moment for international climate negotiations is currently under way in Poland. It is the next key moment for international climate negotiations. As members of the European Union, our ambition is for this meeting to agree on important implementation guidelines for operationalising the Paris Agreement. We are calling this the “rulebook”. It is necessary for COP24 to deliver confidence that we are on track to implementing the Paris agreement, flexible enough to reflect relevant differences in parties’ capacities, and dynamic enough to ensure that all parties are improving their performance over time. Today, climate change is widely recognised as a major threat to the prosperity and well-being of human beings. Increased concern about the implications of climate change for international security and stability are pushing the EU’s actions on climate diplomacy, not only as a means to coordinate better between EU member states, but also as a platform for further action at the United Nations. The Ministry for Foreign Affairs and Trade Promotion is actively engaged in the EU’s climate diplomacy, as climate diplomats meet regularly under the auspices of the EEAS to coordinate policies in Brussels, while EU foreign ministers frequently touch upon this subject in Foreign Affairs Council meetings. Malta is also supporting small island states on climate action through capacity building offered by the Commonwealth Small States Centre of Excellence. To highlight the growing importance of climate diplomacy, Malta appointed its own Ambassador for Climate, Simone Borg. Her predecessor, Michael Zammit Cutajar served as the executive secretary of the UN Framework Convention on Climate Change for many years. Recently, United Nations Secretary General Antonio Guterres noted that “climate change is moving faster than our efforts to address it”. According to the World Meteorological Organization, the past 20 years included 18 of the warmest years since 1850, the year when methodical thermometer-based recording began. Once again, it feels like history is repeating itself. As in 1988, nature itself is warning us that it is necessary for the world to take another major step to address climate change. It is the scientists who are warning us, through the Intergovernmental Panel on Climate Change, that it is time for the world to make a bigger effort in order to go beyond the Paris agreement to limit global warming to 2°C. Malta is already one of those countries that are working towards a paradigm shift on climate action. Last year, Malta joined the One Planet coalition meeting in Paris to discuss the benefits of cleaner, climate-smart growth. This is expected to bring new jobs, economic opportunities, innovation, and above all, improved well-being for people worldwide. Even where some governments are hesitant to tread, civil society and private enterprise is mobilising. 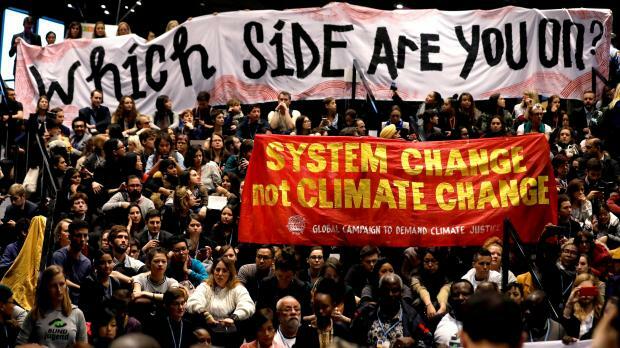 This paradigm shift will now be the focus of a United Nations Climate Summit to be held in New York in September next year. It is time for us all to put climate action again at the top of everyone’s international agenda. Carmelo Abela is Minister for Foreign Affairs and Trade Promotion.